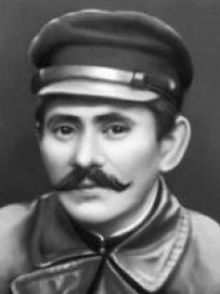 Dzhangildin Alibi Togzhanovich (1884-1953) - one of the leaders of the Central Asian uprising in 1916, Civil War hero, a great statesman - that's about all there is to know about Dzhangildin stingy on the facts of encyclopedias. In Central Asia, especially in Kazakhstan, his name is covered with legends, while in Crimea almost nobody knows. And yet, the fate of this remarkable man is related to the Crimea. This is eloquently proved by the fact that immortalized his rebellion he is coming from ... Simferopol. And in 1917, he returned to Simferopol establish Soviet power. And before to explain this phenomenon, the story of our hero essay about a legend - Alibi Dzhangildin. He was born in 1884 in the village of Koydagul Turgay County. Family - the poorest nowhere. It was not difficult to predict the fate of the poor nomad, had he not met with the missionaries of the young Alibi. During these years, the endless steppes headed Russian priests who had to attach the "wild people'' to the true faith. Dodger kid lively response to all new, learned reading and writing, and on and marvel at all: he was sent to study at the Pedagogical Seminary. Life in the big city, and then Kazan was one of the largest cities in Russia, at first stunned, and then carried away by Man. He moved to Moscow, where he tried to continue his studies at the Theological Academy, but political events that hit the country, and seized it. Alibi excluded from the academy, and even betray "anathema." But it is a little worried about the young Kazakh. He has engaged in self-education, worked as a reporter for newspapers. Having started to explore the world, Alibi could not stop. And then he makes a totally unexpected and even shocking announcement in Moscow and St. Petersburg newspapers. Ad sense was that he would invite the company of people who want to walk with him around ... around the Earth. Responded to two: from St. Petersburg Field Engineer and teacher at the Moscow Institute of Commerce Korovin. In 1908, they began to travel around the world. On the day of friends were on forty or fifty miles. In the villages they gave lectures in cities staged toll evening. Already in Europe Dzhangildin mastered the photographic work, and it becomes the main source of income. Dzhangildin photographed attractions of some cities, and then sells the photos to others. And so the whole route. Passed, Poland, Austria, Hungary ... In Budapest Dzhangildin and his comrades were given a wonderful welcome. At a meeting with travelers gathered all the intellectuals of the city. The focus, of course, was himself Dzhangildin. The fact is that during this period the Hungarian intelligentsia especially fond of the history of the origin of his people, who, in their opinion, has come from far beyond the Carpathians steppes. And they saw Dzhangildin brother. Bursaries young Kazakh, his enlightenment he created a beautiful image. In those years, Russia was represented Europe country of savages and barbarians, but because Dzhangildin sincerely convinced ... stay in Hungary. It is surprising, but left his Russian comrades. Alibi continued the journey alone. Dzhangildin crossed Serbia, Bulgaria, Turkey, Syria, Palestine, Egypt ... Then the path went through Abyssinia, Arabia, Mesopotamia, Persia, India ... In India Dzhangildin underwent an acute attack of the disease, which can be known only one who ever left their homes. This disease - nostalgia. And no wonder she collapsed on the traveler is in India, stop this long path towards the sun, turn to the north, just beyond the mountains, your native steppes. As he wrote then he Dzhangildin, the temptation to stop trip was great, and only a great force of will, he overcame his desire to go home and re-moved to the east. India, Ceylon, Indo-China. Taiwan. Japan and finally Vladivostok! In 1912 (four years later), after having walked across three continents. Dzhangildin returned to Turgai steppe. Even in Turkey, he bought a movie camera and made a few movies. In native steppes Dzhangildin arranged something like field equipment. He went to aouls and camps, shows films about life in Turkey, the other European countries. The new case involves new assistants. And one of them, the most faithful, becomes Amangeldy Imanov, while a clever hunter, great shooter, the same stretch of knowledge nugget. At Alibi friendships with the few Russian intellectuals who lived in Turgai. Most of these were political exiles, and their impact on the emerging world of young Kazakhs could not play a major role. The ideas of equality, social, justice and captivate Dzhangildin and his new friend - a fearless Amangeldy lifestyle which more resembled a sort of Robin Hood of the steppe. Name Dzhangildin before and now enjoys great respect in Kazakhstan. There Turgay region Dzhangildinovsky area. However, if you rename it - do not have to wonder. But, nevertheless, in the history of Kazakhstan Alibi Dzhangildin will remain forever!